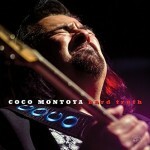 Share the post "Album review: COCO MONTOYA – Hard Truth"
Coco Montoya’s ‘Hard Truth’ is a career highlight for Coco Montoya. It’s an object lesson in old school dynamics and an album glued together by an essential flow. It’s given a contemporary sheen by drummer Tony Braunagel’s intuitive production and John Porter’s bright mix, both of which emphasize the sonic quality of a sparkling band performance. The core quartet of Montoya on guitar and vocals, bassist Bob Glaub, keyboard player Mike Finnigan and drummer Tony Bruanagel anchor the songs effortlessly and provide the canvas for those special moments that make ‘Hard Truth’ such an essential record. You can feel Montoya’s life time experiences bubbling up in the tracks, almost as if he’s been waiting for this moment to lay down a defining solo performance. He makes light of the fact that he comes to the project with barely two co-writes to his name, with a consistency of performance over 11 well chosen tracks that fit together like an album should. He uncovers real feel with vocal phrasing that makes an essential connection with lyrical meaning, while his guitar playing locks into the grooves. And when he belatedly stretches out alongside Lee Roy Parnell’s slide playing on the southern influenced ‘Lost In The Bottle’, he takes the band that extra mile to get more out of the song. ‘Hard Truth is notable for it’s clever choice of material – Montoya is a mature artist in need of meaningful songs – and the way the songs mesh seamlessly into a linear flow. He draws us in from the opening Warren Haynes penned, Allman Brothers classic ‘Before The Bullets fly’ and the band takes off on the celebratory Ronnie Earl shuffle ‘I Want To Shout About It’. Then there’s the deep groove of ‘Old Habits Are Hard To Break’ and the Albert Collins’s funky ‘The Moon Is Full’, which is effectively a showcase for everything that is great about Montoya, impassioned vocals and imperious guitar playing with a resonant tone. And just when you think he’s revealed his full hand, he leans into the riff driven title track masterpiece to sing his heart out. ‘Hard Truth’ is a significant career milestone for the soulful, blues-rock sideman turned solo artist, as he stamps his personality on high quality interpretative singing and incendiary guitar playing. His tonal depth and variety of attack underlines the album’s subtle dynamics, as evidenced by another highlight, the Terry Wilson penned ‘I’ll Find Someone Who Will’. The band builds up a muscular funky groove with a potent hook, punctuated by Finnigan’s organ pulses and majestic bv’s from Teresa James, Deb Ryder and Billy Watts, as the man himself adds a kicking solo. There’s a also a lovely gospel feel to ‘Devil Don’t Sleep’ over a big drum sound from Braunagal and nuanced slide from Johnny Lee Schell. The same feel is extended on the closing Montoya/Dave Steen co-write ‘Truth Be Told’, which perfectly bookends the album, as the band stretches out one last time on a funky wah-wah driven groove. There’s a lovely stop-time break, before they surge into the outro with the kind of mellifluous sweep that sounds as if they’ve been playing together for years. This entry was posted in ALBUM REVIEWS, ALBUM REVIEWS (Mobile), All Posts, The Best of 2017 and tagged Albert Collins, album, Alligator Records, Allman Brothers, Billy Watts, blues, Bob Glaub, Coco Montoya, Dave Steen, Deb Ryder, funk, Hard Truth, John Porter, Johnny Lee Schell, Lee Roy Parnell, Mike Finnigan, review, rock, Ronnie Earl, soul, Teresa James, Terry Wilson, Tony Braunagel, Warren Haynes. Bookmark the permalink.